Hi readers, this is my first video on this blog. As I made this video using basic tools, it is not perfect. So today I am going to teach you shortcut tricks used to solve Time and work chapter. You can also read this method in my previous post. 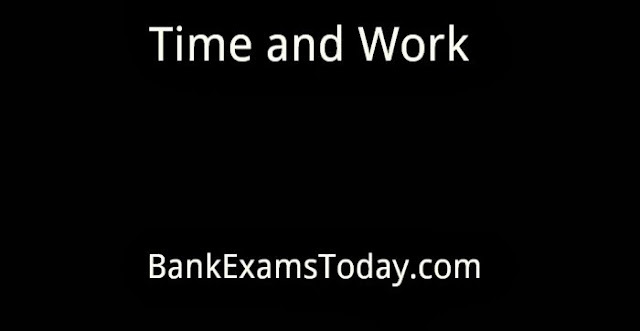 Time and work is an important chapter for IBPS, CAT, SSC and other important exams. In this video I have discussed two methods to solve time and work questions. I personally prefer efficiency method, in which we find per hour or per day efficiency of the worker. You need to learn value of fractions to learn this method. In my previous time and work post I have given value of various fractions. Till now there are just 5 views on YouTube. If you want me make more video then subscribe to my YouTube channel, press thumbs up and share it with your friends. I am trying to teach basic concepts. Very good effort Ramandeep ji...I am learning a lot from these videos and website articles..A sincere THANKYOU.. I appreciate your efforts Ramandeep ji....great work!!!. I am doing everything myself. If you attempt 120 questions with 80% accuracy than 150 questions with 60%, obviously you will score high when you maintain high accuracy. Thanks for providing the link...with this I understand that accuracy is not considered in evaluation procedure. Of course, 120Qs with 80% accuracy than 150Qs with 60% is high...... you said - 'Accuracy is key...' in general sense and not related to evaluation procedure....right ??. If, A attempted 20Qs and all 20 of them are correct, Score A=20 and B attempted 25Qs and 21 of them are correct, Score B=20. In this case, do A and B get same score?? or A get more...??? I want to understand this properly because I frequently see my friends talking about accuracy in different ways...in the above mentioned example my friends say A get better score than B. Is that true ?? ?